I always knew that this karateka had potential, but a black belt at 6 weeks old must be a world record. Can you Identify him, please post your answers in the comments below. Saturday 16th February 2008 at Wiggington Recreation Hall, Wiggington , York. 1.30pm for 2pm to 4pm, All grades Training only. There is an open invitation to all, to assist hosting Sensei on Saturday Night, a meal and a little wine / Guinness. Sunday 17th February 2008 at Wiggington Recreation Hall, Wiggington, York 9.30am for 10am to 1pm. All grades training and grading. Training Fees :- £18 one day or two days, its the same price so get along to both days if you can. Grading Fees: 9th Kyu to 1st Kyu £10 and for Pee Wee grades £6. Don't forget if your grading you must come and train and the fee is £28 or £24 for training and grading. We wish all of the York District Karateka good luck and keep up our high standards. Selby Karateka, please let Paul know your intention to attend/grade asap so that he can complete all paperwork and payments with Sensei Ian Shaw. This will greatly assist in a smooth administrative process over the weekend. For more information contact Sensei Ian Shaw - ianshawy@btinternet.com or e mail me from the link at the top of the sidebar. Rebecca, Dominic and I have just returned from Sensei Kato's, another great course. I have asked Dom to drop me a mail of his thoughts on the course. It was the first time that I have taken him to Sensei's to train and he was a little apprehensive to say the least. Now only the guys from the Whitchurch Hombu dojo could have come up with this site. I will have to put my thinking hat on and come up with an entry to submit to the committee. Nice to train and spend the weekend with our karate friends, thank you for making Dom so welcome, Osu! Photo Competition No 2 - Guess who? Sensei Andy said I would be silly not to put this photo on the blog. The karateka on the Right is now a 1st kyu at Selby, the photo was take ten years ago when she was still quite sweet. A bit of Kihon, some Kumite and an awesome team kata, "Unsu" by Kagawa Sensei's dojo. 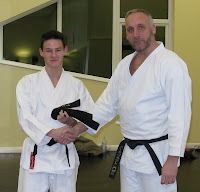 It has been a while since Thomas graded and we ordered his personalised black belt as a presentation from the club. In the period since Thomas graded to Shodan we have noticed his Karate getting sharper and sharper. Thomas is always of a relaxed nature but he is enjoying not having to think about grading for a while and just concentrate on his own training. This Week Thomas spent over an hour teaching Josh Heian Godan on a one to one basis trying to refine his technique prior to Josh's grading in February. Sensei Andy noted after Josh's demonstration of Heian Godan that it was the best kata he had seen Josh perform in the past, a tribute to both Josh and Thomas's effort, well done both of you! These are the provisional dates for 2008, dates are sometimes a bit fluid between now and Easter, so please bear this in mind. The date for the first York Course and Grading is early this year so please make every effort to attend all sessions and consider getting in a few additional training sessions at York or Haxby Clubs. I had a E Mail from Sensei Mark Watts this morning wishing all us Yorkshire type people a Happy New Year. I noticed that Mark has recently started a blog for the Whitchurch dojo so I checked it out and have added a link in the side bar, please check it out. Above: Whitchurch dojo : what a place to train..Kato Shihan and more Sensei than you can shake a Shinai at! Mark congratulations on the blog and looking forward to training with you all soon, Osu!